This hearty side dish is perfect for the holiday table. 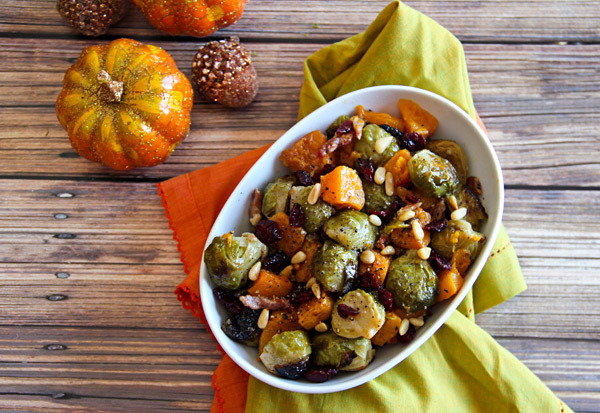 Mixing Brussels sprouts with butternut squash, cranberries, with just a little bacon creates a delicious vegetable dish that combines sweet, salty, and savory flavors. Although this is considered a side dish, I love these flavors and can easily eat this dish as my entree. This dish would be perfect paired with roasted turkey or ham, although it also works well with any roasted meats. We added some chopped bacon, dried cranberries, and pine nuts which really enhanced the flavors of the vegetables, although chestnuts, walnuts, or pecans would work in place of the pine nuts as well. To allow the vegetables to roast and brown completely, we found that it worked best spreading them out onto two foil lined baking sheets. If the vegetables are crowded, they will steam instead of roast and may become mushy. 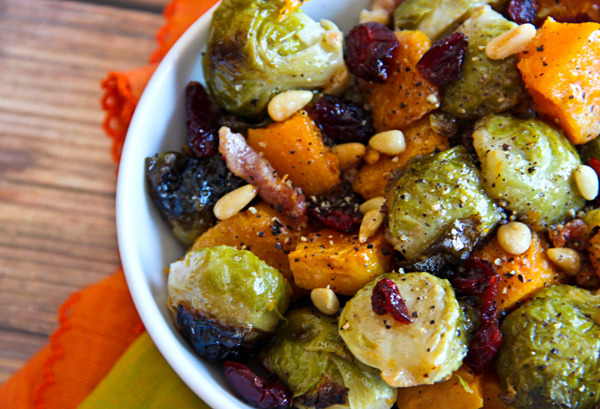 Brussels sprouts are loaded with vitamin A & C, folacin, potassium, calcium. They also have 3-5 grams of fiber per cup, and are rich in protein. 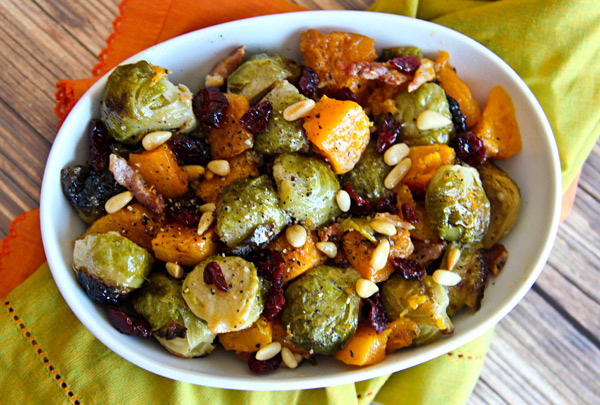 In a large bowl, add the bacon, sprouts, squash, oil, salt and pepper, then toss to combine. Line two baking sheets with foil, then spread the mixture evenly over the prepared baking sheets. Roast 10 minutes, then turn, and roast another 15 minutes or until the vegetables are lightly browned and fork tender. 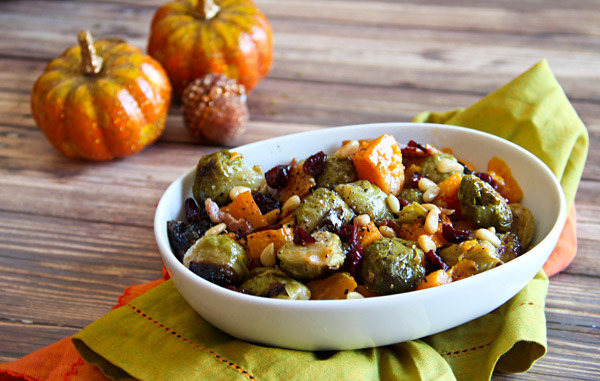 Toss the vegetables with the cranberries and pine nuts and arrange on a serving platter. We had Brussel sprouts for Thanksgiving and my daughter prepared them this way, but in a cast iron skillet. They were delicious!